A survey of recent unrest in the garment industry, as agitation for a greatly increased minimum wage - as part of an improved wage structure - continues. In the past two weeks garment workers' agitations for a large increase in the present monthly minimum wage of Tk 1,662 (£16/€19/$24) have spread and intensified. A minimum wage of Tk 5,000 (£48/€58/$71) has long been demanded - and more recent reports quote a figure of Tk 6,200 (£59/€72/$89). The Ready Made Garment (RMG) bosses have offered only Tk 1,887 (£18/€22/$27). The wages of the 4 million RMG workers working in 4,500 factories - 85% are women - were recently confirmed as remaining the lowest salaries in the world. The factories employ about 40 per cent of the country's industrial workforce. The recent agitation began on Sunday 13th June in Ashulia, an industrial suburb near Dhaka with a history of workers' rebellion. Wildcat strikes began at factories of the Envoy Group, which is owned by the president of the main employers' federation, the Bangladesh Garment Manufacturers and Exporters Association. (In the prolonged tripartite negotiations between workers' representatives, government and employers, the BGMEA has consistently refused to budge on the wage demands, offering only minor increases.) Eight and a half thousand workers struck to demonstrate for wage increases and other benefits; RMG bosses responded by lockouts - closing the factories. Workers barricaded main roads, fighting began when cops arrived, workers lobbing bricks at them; workers then broke up into several groups and began attacking various factory buildings. Other factories then began to shut in an effort to avoid further trouble - but their closure brought more workers onto the streets. Police eventually cleared the area with teargas. Forty people were injured, including ten cops. "workers had been going to work ... and leaving after swiping their punch cards". That the Envoy workers took strike action but didn't bother to send any demands to the bosses of their own workplace suggests that the demand for an RMG minimum wage is now seen as a industry-wide (or even class-wide) movement. Some of the arrested rioters have not been garment workers, but probably other workers from local neighbourhoods who are often drawn into riots as they spill over into residential areas and police enter slum quarters. on Tuesday 15th June at Tejgaon in central Dhaka, 25 were injured in clashes. Police used teargas, baton charges and rubber bullets to disperse protesting workers. 1,300 workers gathered outside their Shomahar Sweaters Ltd factory, expecting it to reopen after its closure since June 10 due to workers' unrest over pay demands. But instead they found a notice informing them the factory was shutting for an indefinite period and that 47 workers have been suspended for "creating anarchy" in previous protests. The workers began an angry demonstration and were joined by fellow workers from nearby workplaces. Clashes with police followed. Saturday June 19th, Savar, Dhaka; 7,000 Nasa Group workers began a demonstration inside their factory demanding the new minimum wage of Tk 5,000. Then, leaving the factory, workers from 16 factories blocked a main highway; eventually tens of thousands of workers poured onto the streets and many clashes continued through the morning. Police used baton charges, teargas, water cannon, rubber bullets and shotgun rounds against workers, who replied with volleys of bricks and barricades; 100 were injured, including 20 cops. Workers also damaged over 35 factories, and looted goods worth Tk 12 lakh (£11,500/€14,000/$17,000). The unrest was by now seriously hitting profits; the global purchasers of RMG stock - including leading US and European brands - demand fast turnaround times with contractual financial penalties for late deliveries of orders. The boat workers' strike last month(1) meant RMG companies were forced to shift from cargo shipping to using far more costly air freight services - now, the garment workers' unrest was having the same effect. "Foreign buyers have lost confidence on our industry following the vandalism. If such unrest continues they may find alternative sources," he said. The negative impact of the present situation will be visible in November, he added. But so far, through years of recurring unrest in the garment sector, the foreign buyers have always quickly recovered their "confidence" in the industry, encouraged by cheaper prices underpinned by the lowest labour costs in the world. The RMG sector made up 80% of Bangladesh's 15.56 billion dollars export last year. 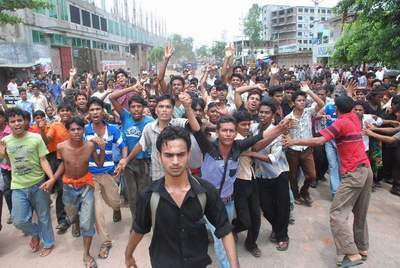 Monday 21st June, Ashulia; the unrest reached a new peak - after growing clashes in the previous two days, over 50,000 striking garment workers again fought with police and paramilitary security forces, forcing closure of at least 300 factories. Around 85 factories were vandalised. The trouble began at the Ananta Group factories, where 10,000 workers staged demonstrations for the basic minimum monthly wage increase. The unrest then spread to the Ha-Meem Group factory, where 26,000 workers held protests and then walked off the job. Soon tens of thousands of other workers joined the protesters after owners of 300 factories suspended production and declared a holiday for the day, fearing large-scale violence. The workers then spilled onto the narrow highway linking the capital, Dhaka, with the northern districts. This massive demonstration of more than 50,000 was described as "turning the area into a "human sea" stretching for miles". Fighting and road blocks continued throughout the day, as intense battles with security forces spread across a wide area. Factory property, including delivery vans, was also attacked, with windows and sewing machines smashed. The protesters were finally dispersed in the afternoon. Trouble was also reported in garment factory zones far from Ashulia. In the face of the sheer scale and combativity of the movement, on Monday night the BGMEA declared an indefinite closure of all RMG factories in Ashulia. The area was swamped with a massive police presence. Labour minister Khandaker Mosharraf Hossain says readymade garment workers will get their remuneration under new salary structure within three months and asked them to calm down. "The minimum wage is in no way well-suited with the current situation," the minister told reporters. "It must be consistent with the price of daily essentials and inflation rate." Nearly a thousand riot police, armed with several water cannons, were in the area where as many as 800,000 people are employed by subcontractors working on behalf of global retailers such as Wal-Mart, Tesco and H & M.
Factories reopened despite smashed windows and damaged sewing machines, desperate to stop the protests affecting orders from Western buyers, said garment manufacturer Envoy Group's director Sultan Noorani. "We are worried about late delivery - if you are late by one day, international buyers cut five percent off the order price," he said, adding that his factory was now late on an order of shorts for Wal-Mart. RMG bosses claim that due to the recent unrest "exporters were forced to spend 13.11 billion taka on air shipment between December and April to meet buyers' deadline". Negotiations continue on the wage issue. But the 'workers' representatives' bodies in the garment industry function more like NGOs than Western-style unions. Factory owners have refused to allow conventional union structures to mediate workplace disputes and conditions. Consequently, the class struggle in and around the factories is only loosely related to both negotiations and negotiators and acts largely independently of them. So far, there have been less than a dozen arrests of workers reported, and a handful of sackings. Warrants have been issued against 180 named people; while a blanket criminal charge has been brought by the police against 60,000 - sixty thousand - unnamed participants in the protests! ... But experts warn more violence is not far off. "Unless the wages are increased, protests, riots and stoppages will persist," said Ifty Islam, an investment banker at Dhaka-based Asian Tiger Capital, advising factory owners and Western buyers to give ground in the escalating dispute. "It would be worth it for them in the long term," he said. "Bangladesh has a huge opportunity to capitalise on rising costs in China but it is difficult to get more foreign firms to come if we can't prevent labour unrest." The violent protests threaten to undo the benefits the global economic recovery has brought Bangladesh -a 15 percent year-on-year increase in exports for April and May 2010, said Dhaka-based economist Mustafizur Rahman. With full shelves for Western retailers dependent on reliable fast turnaround times for factory orders, strikes remain a potent tactic for garment workers. With full order books for RMG bosses dependent on timely delivery for the cheapest prices, low wages continue to be seen as a necessity by many factory owners. An announcement on the new wage structure has been promised for July 28th. The struggle continues.